No better way to spend a Saturday night than at the ballpark. I was lucky last year. I worked for the Lansing Lugnuts as a game day employee in the marketing department. I had a seat in the first base dugout for 95% of the ‘Nuts home games last year. It was awesome. I thought about buying season tickets before the season started then I got an opportunity to get paid to go to the games. It was a lot of long, hot days for a team that wasn’t very good, but it was fun. Kalamazoo will be the first time since I’ve moved out on my own that I haven’t lived in a town that had a Midwest League ball club. I really like the MWL. Sure, it’s low-A ball, but the games are a lot of fun. It’s always fun to watch kids trying to make it in the bigs. This spring, I turned on a spring training game between the Tigers and Blue Jays and thought, hey, that short stop looks really familiar. Turns out, it was Tyler Pastornicky. The name probably means nothing to you, but to me, it’s a name I knew well. Tyler had a pregame ritual last season that included giving me a fist bump before every home game. Still, baseball is baseball and J and I have been excited to check out a game at Homer Stryker Field. 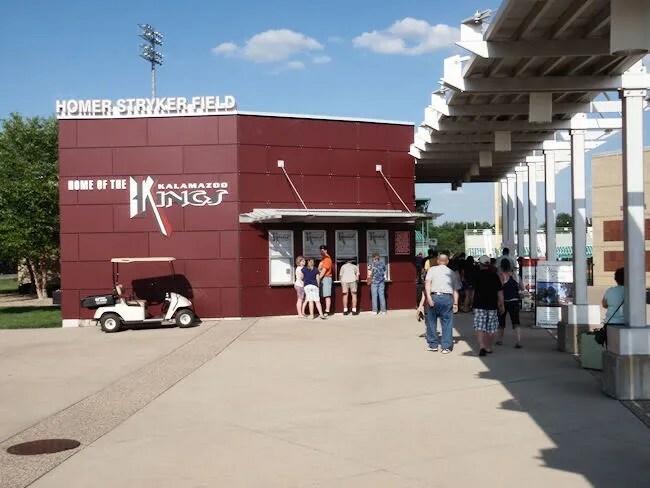 The park is home to the Kalamazoo Kings of the Frontier League which is independent baseball. None of the teams are affiliated with Major League teams. Most of the kids finish their career in the Frontier League, not start it although some do make into the MiLB system. 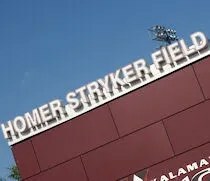 Homer Stryker Field is part of the Mayor’s Riverfront Park on Mills Street and King Highway southeast side of Kalamazoo. We were pretty early to the game and had no problem parking in the large lot near the entrance of the stadium. There’s a long walkway that leads from the parking lot into the stadium area. The ticket office is right out front and it’s connected to the Kings business office. In front of that is a statue of Homer Stryker for whom the stadium is named. It’s not hard to figure out who Homer Stryker was if you know anything at all about Kalamazoo, but what is interesting is that he was a pretty good ballplayer for U of M and had a chance to play professional ball, but decided to go into pharmaceuticals instead. Tickets for the game are either $6 or $8. We went with the $6 which are GA tickets. The seating is broken up into three different grandstand areas. The one directly behind home plate has the bleacher GA seating in what could be from the 1963 remodel. It’s a permanent cement structure that has aluminum bleacher attached to it. On top of that is another grandstand that has individual seats. 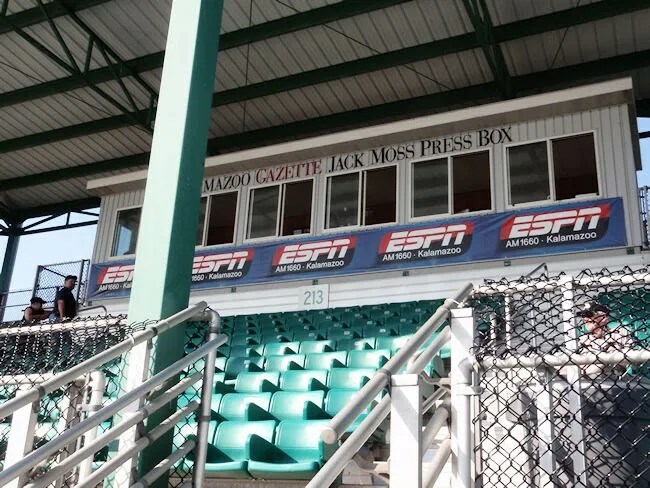 The press box sits on top of that. Behind either base line is another set of bleachers. The first six rows of these stands are individual seats which are the $8 seats. Everything above that is GA and bleachers. 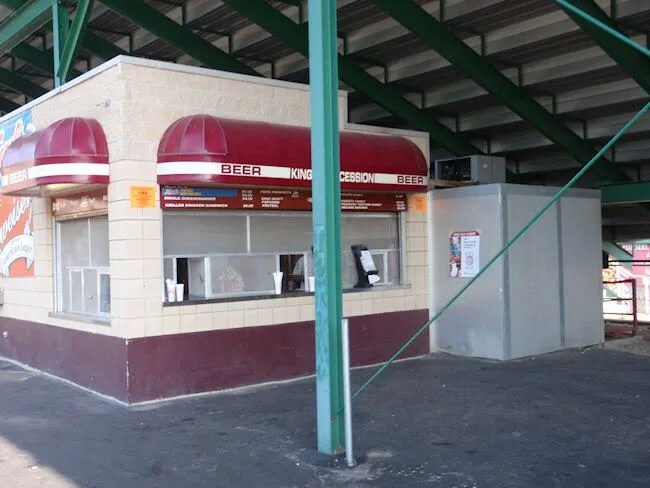 The concession stand is underneath the 1st base bleachers. They have a pretty simple menu. Nachos, cheeseburgers, Koegel hot dogs, beer, and Pepsi. We were both really thirsty when we got there and got a couple pops. By the third inning, we were parched again and went back for two more Pepsi’s. We spent as much money on drinks as we did on tickets. It was hot and there’s very little shade. Only the top grandstand bleachers have any cover. The rest are out in the sun which sets sort of over right field. The game was pretty rough. 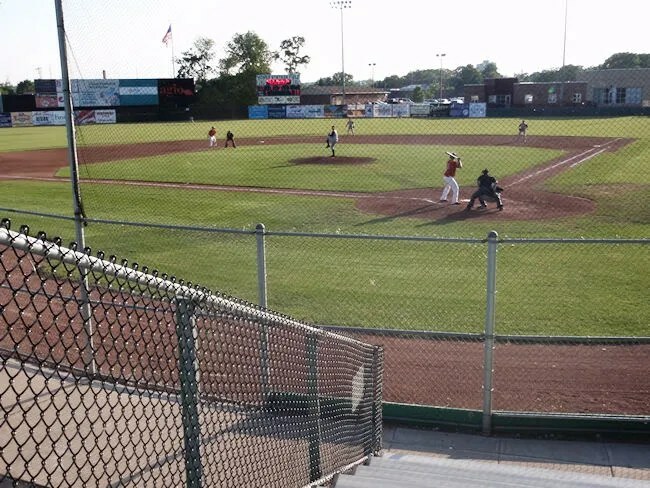 It showcased the two bottom teams in the Frontier League’s East Division. The game started out with a ton of hits from the visiting Lake Erie team, but the Kings actually did end up coming back and winning the game. I’ve been to a few independent league games…(mostly in Joliet at Silver Cross Field which is in the Northern League, but still an independent league) and the game in Kalamazoo is right on par with those games. All the players are professional players. Some have come right out of college without being drafted. Others have spent time in the Minor League system and have been released. Whether is an affiliated team or an independent team, any town is lucky to have a professional ball team. It’s a quality of life issue. Who doesn’t enjoy a night at the ballpark? It’s a good family night out and kids don’t care who’s playing. It’s a fairly cheap form of entertainment. You couldn’t bring your kids to a movie for $6 and even then, you’d be stuck inside. The Kings run a number of specials on weeknights and you can get in to the game pretty cheap. Don’t write the Kings off because they’re not a Tigers affiliate. A night at Homer Stryker Field can be what you make of it. Make it a good time. We did and will do so again. Parents can visit their childs classroom and observe the program. Jordon Casinger works in writing company as a professional academic writer. Not all writing companies employs professional academic writers. Most people perceive the act of writing a book as an academic thing. Why, oh why, is showing appreciation such a difficult thing. someone with authority who knew what they were talking about. with the best essay help in writing different academic papers. essay has to accomplish certain business.